The following two-part interview is one I originally conducted for Herbivore, an animal-rights magazine based in Portland, Oregon. The magazine declined to publish it, for reasons they never shared with me. Given that Herbivore readers were the original audience, most of the questions focus on animal issues. However, I am posting it here on the hope that it might also be of interest to a general audience. It appears here for the first time. 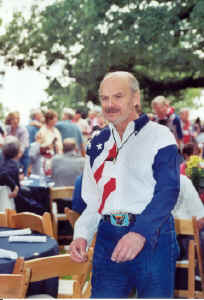 Henry Mark Holzer at the River Rats/Nam Pows Reunion in Fort Worth, Texas, 2002. Henry Mark Holzer served as Ayn Rand’s lawyer in the 1960s and 1970s. Click on his Web site henrymarkholzer.com, and you’re liable to come across an article defending the war in Iraq or blasting the likes of John Kerry. Yet Holzer has long combined right-of-centre political advocacy with an equally impassioned advocacy on behalf of animals—what you might call putting the right in animal rights. Holzer is a vegan who taught at the Brooklyn Law School until his retirement in 1995. Much of his work on behalf of animals has been conducted on a legal level. Over the years he’s been involved in several important cases, including one that concerned animal sacrifices performed by adherents of Santeria, an Afro-Carribean religion, that went all the way to the U.S. Supreme Court. Holzer’s other noteworthy activities have included working with his wife Erika Holzer to rediscover and restore a film version of Rand’s novel We the Living that was illegally made in fascist Italy, only to be lost for many years. Holzer now lives in Bermuda Dunes, California. From there he shared his thoughts about the early days of the animal protection movement, right-wing support for animals, and life with Ayn Rand. When did you first become interest in animal issues, and what form did your original involvement take? Compared to today, were there less organizations and resources available to animal advocates of your generation in the early days? Was it even more challenging to advocate for animals back then? If we define “the early days” as when I brought the Kosher Slaughter Case in about 1970, there were no legal animal advocates, except perhaps the very few “in house” lawyers who worked for the very few national organizations e.g., the Humane Society of the United States (HSUS)—but they didn’t do “principled” cases like the Kosher Slaughter case. They did mostly very fact-specific cases (e.g., closing a rotten shelter). The resources (e.g., data banks, case books) were nonexistent. It was more challenging in the sense that what some of us were trying to do was writing on a clean slate. There were few if any precedents, and to most people, including lawyers and judges, the idea of any kind of animal rights was absurd. Now, “animal law,” is an accepted, if not welcomed, specialty. In the early 1980s, together with the International Society for Animal Rights I organized the first conference ever held of lawyers who were interested in the subject of animal rights. We scoured the country obtaining names, and names from names, etc., and had about thirty attendees. Most of today’s prominent lawyers in the field were there. Indeed, the Animal Legal Defense Fund and David Favre’s organization at Michigan Law School (the Animal Legal & Historical Web Center) came out of that conference. That was truly the beginning of an organized animal rights legal movement in the United States. Now there are law school case books, appellate cases, law journals, data bank. Internet sites—many legal tools. A New York-based practioner of Santeria. You worked on a high-profile 1992 Supreme Court case, Church of the Lukumi v. Hialeah, which revolved around the issue of animal sacrifice. The case was brought by practioners of Santeria, an Afro-Cuban religion, who objected to an ordinance in the Florida city of Hialeah outlawing the sacrifice of animals in religious rituals. What was the nature of your own involvement in the case, and what message do you think animal advocates should take away from the Court’s decision? I am a trustee of Institute for Animal Rights Law. The Institute, at my behest, filed two “friend of the court” briefs (written by myself and a former student) in the Supreme Court and we attended oral argument. Essentially, our position was that the Santerians’ claim to free exercise of religion did not trump the city’s power, in those narrow circumstances, to prohibit the practice of animal sacrifice and the consequential dumping of dead animals throughout Hialeah. We lost 9-0. There were at least three messages: (1) the city should have had better counsel, (2) the Supreme Court’s “free exercise” jurisprudence is in disarray, with very fuzzy lines existing about what “free exercise” really means when it is arguably in tension with other public values, and (3) all judges need to have their consciousnesses raised about animal issues. The latter has been happening, but it is a slow, tedious process. You and your wife Erika Holzer were Ayn Rand’s lawyers in the 1960s and early 1970s. What kind of cases did you work on in that capacity? What was she like as a client? (You must be asked this all the time). As a client, she was easy, and she was difficult. She was a genius, so she quickly grasped what needed to be understood, and all the implications down to the end of the line. She was a genius, so she would be impatient and not infrequently kill the messenger (or the lawyer). For part two click here. Mark Holzer might have a soft place for animals, but he and his wife are incompetent researchers and writers. All you need do is read a few of the articles they wrote on John Kerry’s military awards back in 2004 to know that they do not bother to do the most elementary research of source documents, but simply work backwards from their own rather nutty opinions. As a result, they are the laughingstock of the Internet. Deservedly so. Hi Zuzu. Thanks for your comment. Please see number two on the enclosed list. About ten years ago, I witnessed a Santeria ritual in someone’s home in Havana. It appeared to be a hybrid of Christianity, animism, and Cuban dance. Partway through the ritual, a man began to move about the room as though possessed by the spirit of a chicken; his eyes suggested he had fallen into a deep trance. While this may sound absurd as I describe it, it had an eerie quality at the time. The practitioners didn’t seem to mind the presence of two Canadian tourists: so much alcohol was consumed, and there was such a powerful group psychology at work in the room, I think many people were oblivious to our presence. Tibor Machan accuses Holzer of not having an argument for the improved treatment of animals, but goes on to make a number of unargued assertions of his own. Part of the problem may be that Machan does not have a well worked out philosophical position on animals, as is pointed out in the definitive review of Putting Humans First, available at http://aphilosopher.googlepages.com/machan.pdf. So, I just saw this: “Machan does not have a well worked out philosophical position on animals.” How well is “well worked out”? Will a whole book, with major portions devoted to the topic, come close? But here is the gist: rights must be grounded in reality and human rights on the reality of human nature, which includes moral agency. This is not present for animals (although here and there, say among great apes, some show signs of what certain people want to interpret as moral agency). Thus the ground for animal rights is missing, just as it is for animal guilt or regret or culpability.